My review of “Ironskin” is a part of a mini-review series to write about books that I read while on blogging hiatus last fall. I had originally planned to write about it during the R.eaders I.mbibing P.eril challenge. I received an electronic copy of the book through NetGalley in exchange for an honest review. 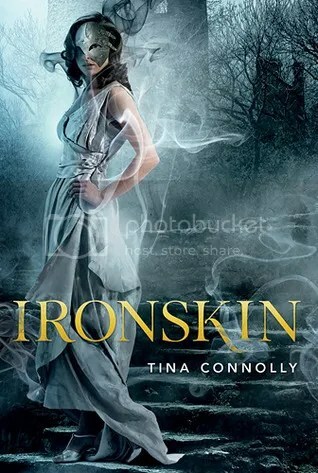 Tina Connolly’s Ironskin is a young adult re-imagining of the the story of Jane Eyre, but with angry fae. Jane Eliot was wounded with fae shrapnel during the Great War, and now she must wear an iron mask over her face to keep the fae magic from leaking out. Jane is stigmatized because of her condition, but is hired as a governess to help a child whom she is certain is cursed with a similar affliction. Dorie’s powers have scared away other governesses, but Jane is determined to stay. Meanwhile, she finds herself falling for Dorie’s father, the mysterious Edward Rochart. This book had so much going for it. There were a plethora of elements to love–Jane Eyre, the fae, the gothic atmosphere, the steampunk element. At the same time, I felt underwhelmed by the book’s ability to live up to its own potential, even though I can’t point out any one specific thing that’s “wrong.” It just didn’t come together as organically as I would have liked. I’ll still give it props for creativity (especially the wife-in-the-attic twist, which is NOT a spoiler, because it isn’t a wife in the attic). Good for a light read, but don’t expect a masterpiece. I received a copy of Morlock Night by K.W. Jeter from the fine folks at Angry Robot in exchange for an honest review. Angry Robot puts out some awesome books, and if you haven’t already, you should definitely check them out. 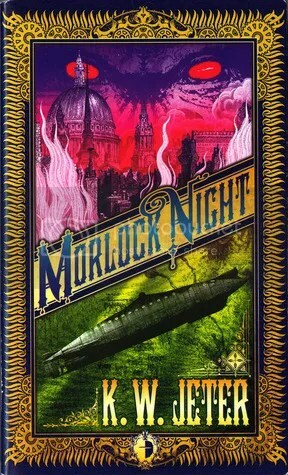 Morlock Night is a steampunk novel that picks up where H. G. Wells’ The Time Machine leaves off. 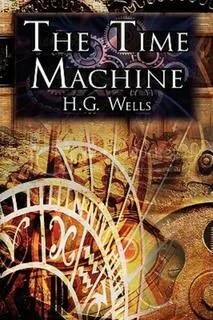 The protagonist, Edwin Hocker, attended the dinner party in Wells’ story and heard the tale of the time machine, but thought that it was merely a fanciful story. It turns out that the story was true, and now the Morlocks have possession of the machine and are poised to take over Victorian England. Morlock Night is an ambitious novel, as it pairs the story of The Time Machine with the legend of King Arthur. That’s right. Who better to save England from her most dire hour than he reincarnated Hero of Britain? Of course, that’s not as easy as it sounds, because Merlin’s archenemy, Merdenne, has joined forces with Morlocks. He’s captured both Arthur and Excalibur, and so Hocker must suspend his rationality and disbelief, otherwise all is lost. For such an enterprising and complex story, I felt that Morlock Night accomplished its goals well. I’ve read other steampunk novels that feel cluttered, or that try to incorporate so many different elements that they don’t quite do any of them well. I didn’t get that impression here. Jeter was able to integrate several different mythologies, including King Arthur, The Time Machine, and the legend of Atlantis, and I was impressed that he was able to pull it off. Jeter does take some liberties with the source material, but it’s for artistic reasons, and I’m okay with his interpretation of Wells’ vision. Jeter incorporates the same tone as H.G. Wells as he tells his story, which makes the novel campy and fun. This isn’t *serious* reading, and it’s not meant to be. 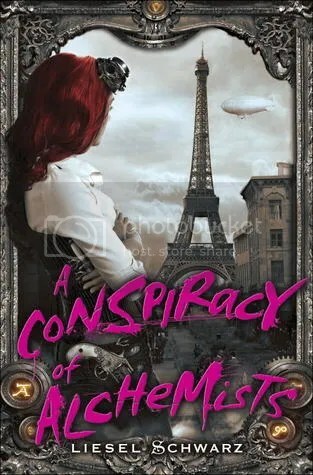 It’s a pulpy steampunk adventure, and I loved it. One of the things that I enjoy about steampunk is its ability to incorporate strong female characters. In this case, Hocker’s sidekick from the future is a woman named Tafe who fought in the resistance against the Morlocks. She disguises as a man when she time travels to before the invasion, and Hocker wouldn’t have been able to succeed without her. If you’ve read The Time Machine and are into steampunk, Morlock Night is an excellent adventure. It’s a quick read and definitely worth giving a chance. By the way, does anyone else adore this cover as much as I do? I love the 1960s psychedelic feel that it has. If it were a poster, I’d want it on my wall. The creepy eyes and the submarine are awesome. Good evening everyone! Today is my stop on the TLC Book Tour of Liesel Schwarz’s debut novel, “A Conspiracy of Alchemists,” which is the first book in the Chronicles of Light and Shadow series. I received a free copy of the book in exchange for an honest review. I received a review copy of Lilith Saintcrow’s “The Iron Wyrm Affair” while I was at BEA earlier this summer. 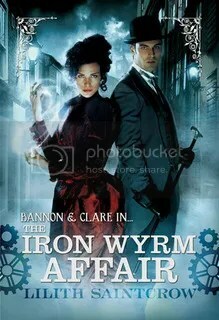 “The Iron Wyrm Affair” is a delightful blend of steampunk and mystery set in an alternate version of Dickensian Britain. Mr. Archibald Clare is a Mentath, which means that he has the superpower of deduction. When the corpses of Mentaths (some of which have had certain body parts removed) begin turning up, Mr. Clare falls under the protection of the feisty sorceress Emma Bannon. With the help of Miss Bannon’s Shield, Mikhal, they must uncover who is behind a plot which might threaten Brittania herself. 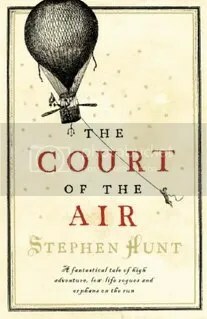 Stephen Hunt’s “The Court of the Air” is a steampunk adventure in which the fate of the world hangs in the hands of two orphans on the run. Molly is apprenticed to a brothel, but on her first day of work her first customer tries to kill her. As it turns out, she’s got a huge bounty on her head and is completely baffled as to why. Meanwhile, Oliver has spent his whole life secluded because he’s part fey and people are afraid of him. When his Uncle is murdered, he finds himself in the company of the disreputable Harry Stave, a member of the shadowy Court of the Air. This book has so many things going on at once. There’s political intrigue, robots, airships, mutants, torture, Lovecraftian insects, human sacrifice, steam engines, and a frickin’ mushroom forest! I’m a big fan of the mushroom forest. At the same time, the author tries to cram too much action into one book, which means that if your mind wanders for thirty seconds and you glance down at the page, you’re completely lost. There are scores of minor characters who only show up for a chapter or two and then are forgotten about for most of the book. The author keeps introducing new characters up until the very end, and it’s difficult to keep track of all of them. This is an adventure story, so there’s little to no character development. At the same time, the worldbuilding in the kingdom of Jackals was phenomenal. Jackals is governed by a Parliament, and political debates involve two opponents beating the crap out of each other with big sticks. The monarchy still exists, but the king gets his arms chopped off so he can’t oppress the people and is mostly around so the people can throw rotten fruit at him if anything goes wrong. The major villains are “communityists” who believe in enforcing equality by putting everyone into identical clunky cyborg bodies. Hunt’s world is incredibly complex, to the point that I think that most readers will either love it or hate it. I’m rather ambivalent about it; I think it had a lot of wasted potential and could have benefited from some expansion. The book could have worked really well if there was a bit more explanation and we got to spend a bit more time getting to know each of the characters, but I felt like the story was too rushed to be fully enjoyed. There were a lot of individual elements to the story that I loved, but the book didn’t work for me as a whole. “The Court of the Air” is the first book of the Jackelian Saga, but it functions well as a standalone. Because of the complexity of the story it takes a deceptively long time to read. I’d suggest it only if you’re a big fan of steampunk and have the time to digest it slowly. 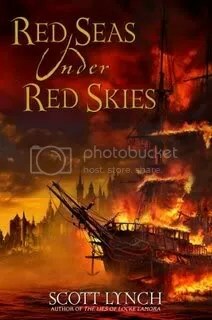 Welcome to the second week of the Red Seas Under Red Skies readalong hosted by The Little Red Reviewer. 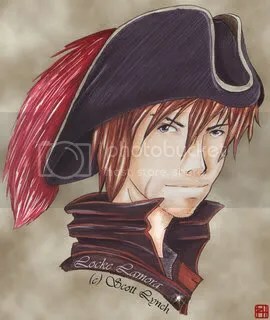 The RSURS fan art to the left is Locke Lamora – colour by tenleftthumbs. It seemed particularly fitting for this week’s section of the book. It might take me a couple days to get around to visiting everyone’s posts; it’s finals time and I still have some work to finish up before the weekend’s over. Scott Lynch doesn’t cease to amaze me with sheer number of ways that he can come up with to torture people. Poor Selendri… My guess is that even though Selendri got her arm burned off she’s still working for the Archon. I don’t think you can just stop being an Eye. There’s a reason why she doesn’t like Locke, and I think she knows that Requin is being played. If so, then why isn’t she telling on him? To reiterate from the last question: Scott Lynch doesn’t cease to amaze me with the sheer number of ways he can come up with to torture people. Please oh please let Locke give them all a dose of their own medicine. Lady Saljesca gets Falconer treatment though. It’s very rare that I wish characters to die slowly and painfully, but torturing poor people for your own perverse amusement is WRONG. The Bondsmagi are some pretty scary dudes. I could see the Archon fearing their power, especially if it interferes with his own. Honestly though I think he’s just afraid of losing his funding/navy. I’m thinking Selendri. She’s close enough to the Archon to know that Locke and Jean are up to something, but she’s not stupid and wants to clean things up herself. Of course, I’m probably wrong, and it’s probably someone we haven’t even met yet. Of course, and I can’t wait to see him try! A couple random things bothered me in this section. Don’t get me wrong, I’m enjoying the book so far, but… the tipping scene seemed a bit anachronistic. Tipping’s a pretty modern American concept, and it felt out of place. Also, what’s up with the whole “larboard” thing? I love how we’re seeing so much clockwork in RSURS so far. It gives the book kind of a steampunk aesthetic, which is quite different from Camorr. See everyone next week for chapters 7-10! Edit as of 5/6/12: I was wrong about the larboard and the tipping. I’m learning a lot this week! Also, I skipped a question because I wrote this up in a sleep-deprived haze at 2am after finishing up several papers. Time to write down the answer! I want a cute fluffy clockwork pet that I’m not allergic to! I’m tired of being allergic to everything that’s adorable and fuzzy, and I think the Artificer’s could help me with that.